Sherwood Forest is a great place for cycling – bike routes and network maps, easy trails for beginners – long routes for the adventurous. Clumber Park, with its cycle hire, is ideal for families wanting safe off-road cycling with easy gradients. Sherwood Pines, again with cycle hire, offers a much wider range of off-road trails, ranging from routes for families to very challenging for the really dedicated and the more energetic can really get away for the crowd. The northern part of Sherwood Forest with its quiet country roads and multi-user links offers a large number of possible routes with for those wanting to improve fitness and stamina or stay for a holiday. For up to date maps of public rights of way go to www.rowmaps.com . Just fill in the ‘name of the place’ box near the bottom of the page. 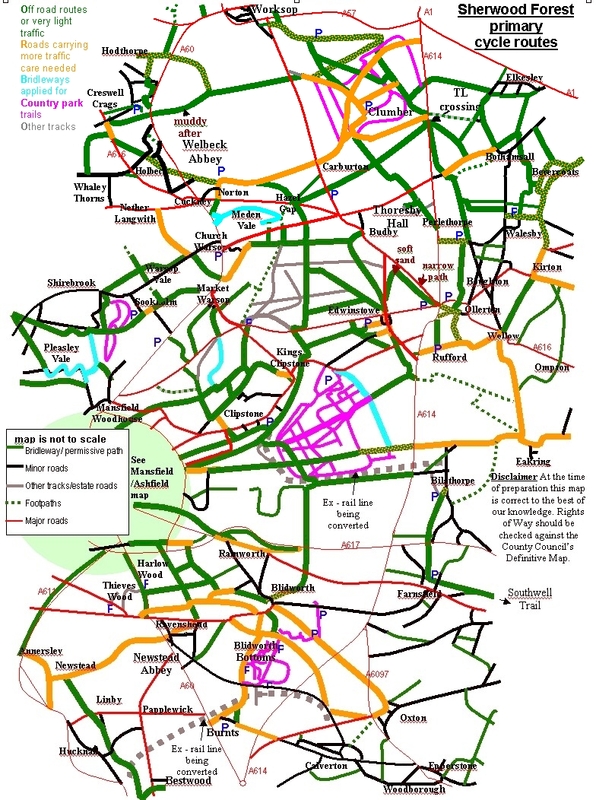 Sherwood Forest Cycle route network – pdf version of the map showing the main off-road and quiet road routes.